The active player must choose one system that he would like to make the focus of his tactical action. He activates that system by taking a command token from his tactic pool and placing it on that system. That system is the active system for the remainder of the tactical action. A player cannot activate a system that already contains one of his command tokens, but he may activate a system that contains other players' command tokens. A player also cannot activate a system if he does not have any command tokens in his tactic pool. During the movement step of a tactical action, the active player may choose to move some of his units into the active system. Each ship has a move value printed on its faction sheet. This value indicates how far that ship can travel to reach the active system. For example, a ship with a move value of "1" can only move to adjacent systems. A ship must end its movement in the active system. A ship cannot pass through a system that contains another player's ships, excluding fighters. A player cannot move units out of a system that contains one of his command tokens. Some ships have a capacity value printed on their faction sheets. When such a ship moves, it may transport a number of fighters and ground forces, in any combination, up to the ship's capacity value. Transported ground forces and fighters move to the active system along with the ship that is transporting them. These units must remain with the ship in the space area, though ground forces may be able to land on planets during the invasion step. 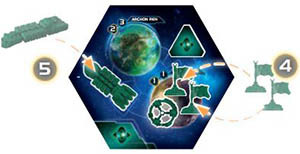 The active player's ships may also pick up and transport ground forces and fighters from systems that they pass through that do not contain any of their command tokens. The Xxcha player activates the Wellon system . He intends to move his carrier into that system along with two infantry and two fighters . His carrier can move to the system because it has a move of "1" . It can also transport the infantry and fighters because it has a capacity of "4". The Xxcha player has two other ships that have move values that are great enough to reach the active system. However, his cruiser  is in a system that has already been activated and his destroyer  cannot move through a system that contains another player's ship . As such, neither ship can move to the activated Wellon system. Some system tiles contain wormholes. 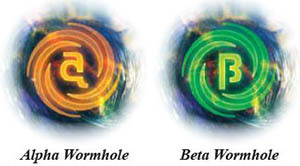 There are two types of basic wormholes-alpha and beta-as indicated by the wormhole's symbol. Systems that contain identical wormholes are adjacent to one another for all purposes. Some system tiles contain anomalies. These systems restrict movement and have special rules governing them. A ship cannot move through or into an asteroid field. A ship cannot move through, but may move into a nebula. A defender's ship in a nebula applies +1 to the result of each of its combat rolls. A ship moving out of a nebula has a move value of 1. A ship cannot move through or into a supernova. A ship that moves through or out of a gravity rift applies +1 to its move value and then rolls one die; on a result of 1-3, the ship is destroyed. After the active player's ships move into the active system, each player's units in the active system may use their "Space Cannon" abilities against the active player's ships in that system. The active player may also use his units' "Space Cannon" abilities at this time. The "Space Cannon" ability is explained in detail later. The number of fighters and ground forces that a player has in the space area of a system cannot exceed the combined capacity of that player's ships in that system. For example, if a player has two carriers in a system, each with a capacity of "4", that player cannot have a combination of more than eight fighters and ground forces in the space area of that system. Ground forces on planets do not count against this limitation. If at any time the number of a player's fighters and ground forces in the space area of a system exceeds the capacity of his ships in that system, the excess units are destroyed. During combat, a player's fighters and ground forces can exceed his ships' capacity, but at the end of the combat, any excess units are destroyed. If multiple players have ships in the active system, they must resolve a space combat in that system. During combat, the active player is the attacker and the other player is the defender. Anti-fighter barrage: Each player's units can use their "Anti-Fighter Barrage" abilities. Announce retreat: Either player may choose to announce a retreat. A retreat will not happen immediately; the units will retreat at the end of the combat round. If a player wishes to retreat with any of his ground forces that are on planets in the active system, he must move them from planets to the space area during this step. Each player rolls one die for each ship he has in the active system. If the result of a unit's die roll is equal to or greater than that unit's combat value shown on its faction sheet, that roll produces a hit. The total number of hits a player produces will be used in the next step. If a unit's combat value contains two or more burst icons, the player rolls this number of dice instead, potentially producing one hit with each die rolled. 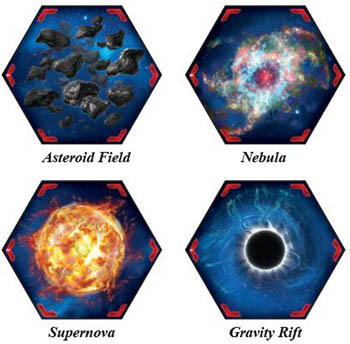 Assign hits: Each player must choose and destroy one of his ships for each hit his opponent produced. A player removes destroyed ships from the game board and places them in his reinforcements. Since players assign hits to their own units, it is a good strategy to assign hits to units that are cheaper to replace. Because of this, fighters are often used as fodder to protect the rest of a player's ships. Retreat: If a player announced a retreat during the first step of the combat round, he retreats. To retreat, the player takes all of his ships from the combat and places them in an adjacent system. The chosen system cannot contain ships that belong to another player and must contain either a planet he controls or at least one of his units; otherwise, the player cannot retreat. If the chosen system does not contain one of that player's command tokens, the player must place one token from his reinforcements in that system when he retreats. If both players have units remaining in the combat at the end of the "Retreat" step, they resolve another round of combat starting with the "Announce Retreat" step. After all units on one or both sides of the combat have been destroyed or have retreated, play proceeds to the invasion step. Some objectives require a player to win a combat; a player has won a space combat if he is the only player with ships remaining in the active system when the combat has ended. Bombardment: If any planets in the active system contain another player's ground forces, the active player may use the "Bombardment" abilities of any of his units in that system. This may allow the active player to destroy some of the defender's units before landing ground forces. Bombardment is described in detail later. Commit ground forces: The active player decides which ground forces he wishes to land on planets. To do so, he takes any of his ground forces that are with his ships in the space area of the active system and places each one on the planet he wishes to invade. Space cannon defense: If another player has a PDS on any of the planets the active player has committed ground forces to, he may be able to destroy some of those ground forces before they land. The "Space Cannon" ability is described in detail later. Ground combat: If multiple players have ground forces on the same planet, those players resolve a ground combat. Ground combats on multiple planets are resolved in the order of the active player's choice. After assigning hits, if multiple players have units remaining on the planet, they resolve another round of ground combat starting with the "Make Combat Rolls" step. After all units on one or both sides of the combat have been destroyed, proceed to the next step. Establish control: The active player gains control of each invaded planet that still contains at least one of his ground forces. When a player gains control of a planet, he gains its corresponding planet card and places it in his play area exhausted. Then, if the planet contains structures that belong to another player, those structures are destroyed. 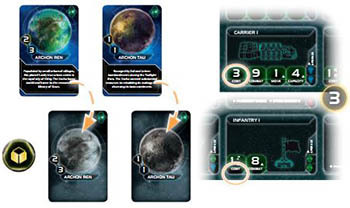 Many effects in Twilight Imperium require a player to spend resources or influence. To spend a planet's resources or influence, a player exhausts that planet's planet card. For example, if a player needs to spend two resources to produce units, he can exhaust a planet that has a resource value of "2" or instead exhaust two planets that each have resource values of "1". The player could exhaust a planet that has more resources, but the excess resources are lost. 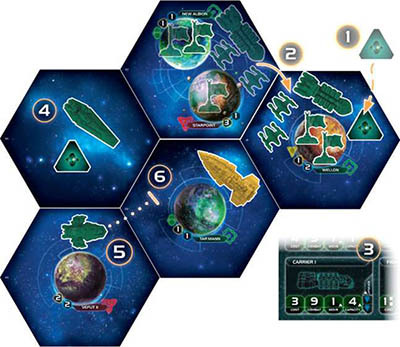 The active player can produce units using his space docks in the active system. When a player produces units, he may choose to produce any of the units on his faction sheet by spending resources equal to the chosen unit's cost. When a unit is produced, the player takes the unit from his reinforcements and places it in the active system. Players always place ships in the space area of the system in which they were produced. Players always place ground forces on the planet that contains the space dock that produced them. When producing multiple units at a time, the cost values of those units are added together to determine the total cost. Each space dock's "Production" ability has a value that limits the number of units that it can produce during this step. A player cannot produce more units than the combined production values of his units in the active system. If a unit's cost is accompanied by two icons, such as the cost values of fighters and infantry, the player receives two units for the indicated cost. When producing these units, each individual unit counts against the production limit. When a player wishes to produce a unit but has no units of that type available in his reinforcements, he may remove one of his units of that type from a system that does not contain one of his command tokens on the game board and return it to his reinforcements. When a player produces a fighter or infantry unit, but has none in his reinforcements, he can use fighter or infantry tokens from the supply instead. These tokens function identically to plastic figures of that type; however, they must be accompanied by at least one plastic figure of that type that matches his color. If a player's space docks are in the same system as another player's ships, those space docks are blockaded. Blockaded space docks cannot produce ships. They may, however, still produce ground forces. The Xxcha player activates his home system . He will be producing units from the space dock located on Archon Tau . He intends to produce one carrier and as many infantry as he can afford. His space dock has a production value of "3", meaning that it can produce up to three units. The cost of a carrier is three resources, and the cost of two infantry is one resource , so he will need to exhaust at least four resources total to produce them. After exhausting both of his planet cards, he is still one resource short, so he must spend one trade good. Then, he places two infantry  on Archon Tau and one carrier  in the space area of that system tile.